Contrary to what some people think, the difference in price between a single thin client and a single conventional desktop computer isn’t much. If we look at the lower end of the thin client price range (which starts at around $250) and compare that with the lower end of the conventional PC price range, there probably won’t be much of a difference. The upfront cost of a thin client isn’t what makes thin clients more affordable. The savings thin clients help you realize actually lie in support and operational costs. Consider the fact that your IT team will be maintaining only one server in a thin-client network as opposed to 50, 100, or 1000 PCs. That’s where you’ll appreciate the cost advantage of thin clients. You’ll also incur lower operational costs because thin clients consume considerably less power than conventional desktops (< 10 watts for a thin client vs ~100 watts for a desktop, if you exclude monitors). In warmer regions, the cost of operating a thin-client network drops even more because thin clients don’t require as much cooling as conventional PCs. If your company wants to keep a low carbon footprint, thin clients are the way to go. Last but not least, thin clients don’t have moving parts, like a cooling system or rotating hard drive. This makes them less susceptible to hardware failures—and the ensuing maintenance costs. All in all, this amounts to a much lower total cost of ownership (TCO), especially for very large networks consisting of thousands of endpoints. 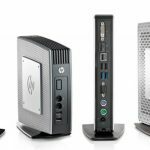 No wonder HP has been selling more than 1 million thin clients each year to various organizations, including hospitals, libraries, government agencies, and retail stores. Parallels® Remote Application Server (RAS) adds more cost savings by simplifying application delivery from the server to thin-client endpoints. This enables IT teams to streamline their network operations and cut down man-hours needed to manage application delivery. Parallels RAS works seamlessly with all major thin-client vendors—including IGEL Technology, 10ZiG, Atrust, Centerm, and VXL—so you gain more flexibility to choose the thin clients that best meet your needs. Try our 30-day evaluation Parallels RAS today! Quora | How much does a thin client cost?